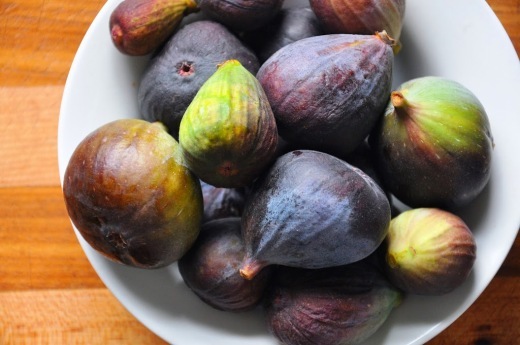 No, this isn’t code for a covert operation or slang for downing one too many drinks; literally, the figs are ripe. The last rays of sunshine have been gone for weeks and the sidewalks are covered in damp red and yellow leaves, along with scattered chunks of pumpkin flesh from the recent Halloween shenanigans. It now gets dark at 4:30pm, almost like some sort of sick joke. Meanwhile, for the last two weeks the figs on our tree have been morphing into luscious purple orbs, one by one. Ameen spotted them first and I seriously didn’t believe him when he told me. 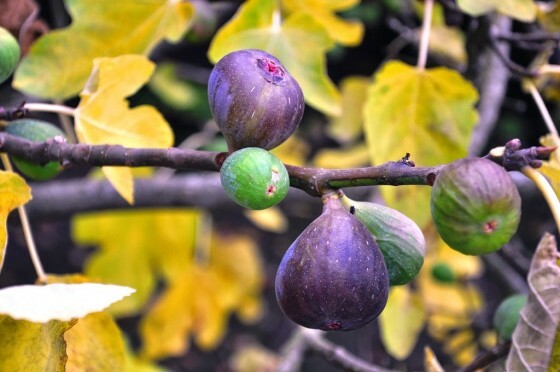 You see, our fig tree has been pumping out hard little green rocks ever since I can remember; when we were kids my brother and I would pluck them off the branches, the fresh cut top of the fruit oozing white liquid like pus from a wound. The insides were white and underdeveloped, crunchy and tasteless—disappointed, we would continue to pick them off the tree and rip them open just for fun. I’ve wondered in recent years if the previous homeowners were duped into planting a poor tasting varietal, because the figs have never ripened on the tree, going from hard and green to shriveled, black and moldy. 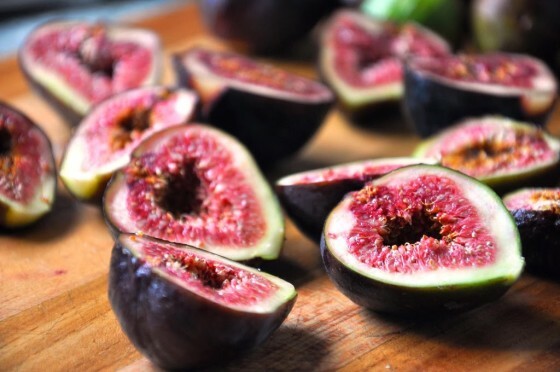 The saying goes, “when life gives you lemons, make lemonade”, but it’s pretty damn hard to make anything at all with flavorless figs. The supposed season for figs in Seattle is August through October and that has long passed, so you can imagine my bewilderment and joy when I ran outside to the fig tree and saw that the branches were indeed speckled with plump, ripe figs (verging on James & the Giant Peach-level excitement). I proudly hand-select the ripest figs from the tree throughout the week, letting them gather on the counter until I decide what to do with them. I turned last weekend’s bounty into this sweet and spicy chutney. 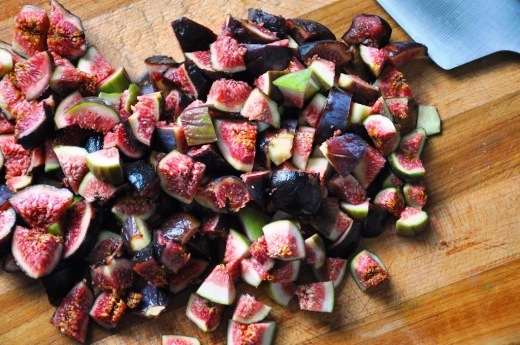 The subtly sweet figs get a boost from brown sugar and red wine, with a swift kick in the pants from fresh jalapeño, ginger and apple cider vinegar. Some softened onions and a mix of cardamom, cinnamon, bay leaf and allspice successfully straddle the line between sweet and savory. This sort of late-blooming, home-grown bounty calls for serving in a celebratory manner; baked into an olive oil cake or roasted with thyme and honey; perhaps glazed onto roast pork, sautéed with wilted greens and toasted almonds or simply dolloped warm over a triple crème brie. Finally, after years of bitter harvest, I was able to make sweet, sweet lemonade. 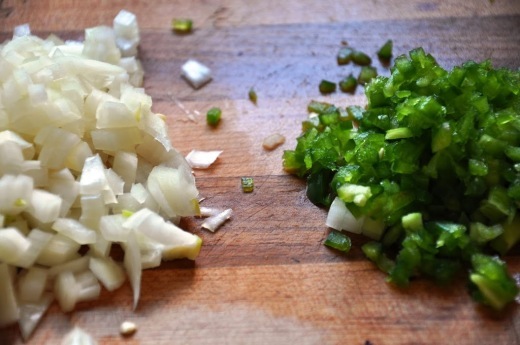 Sweat the aromatics. In a medium sauce pan, heat the oil over medium heat and sauté the onion, jalapeno and ginger until translucent and fragrant; about 5 minutes. 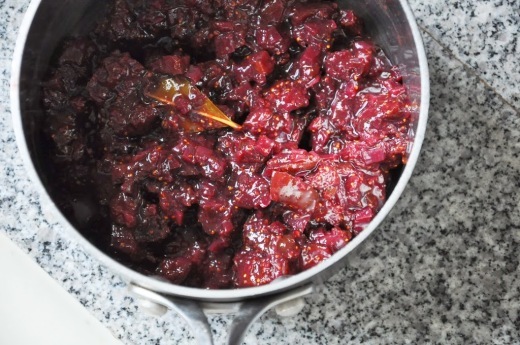 Simmer the chutney. Add all of the remaining ingredients, bring to a boil and reduce the heat to low. Simmer the chutney for 1 hour, until thickened. 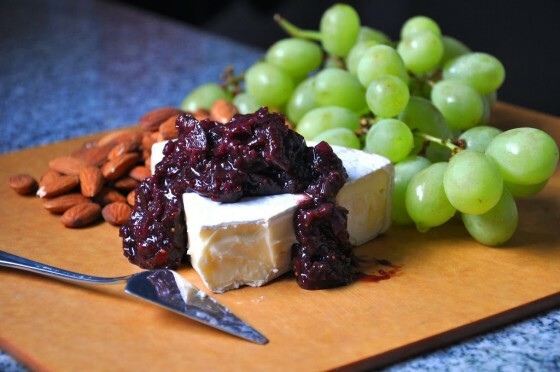 Taste the chutney and adjust the seasoning if necessary with salt or cider vinegar; it should be a balance of sweet and tart with some mild jalapeno heat on the finish. Allow to cool and pack into a jar or airtight container; refrigerate up to one week. My mouth is watering and I can’t wait to get home to make this chutney! Should I remove the pods before packing into the jar? Hi Adriana! I generally leave the pods and whole spices in the chutney, but you could take them out before putting it the jar. Either way, enjoy! Sorry, but yuck! The usual problem with converting “cups” to metric but I did and triple checked. Far far too sweet so I am now making a second batch without sugar and will mix the two. I’ll have enough for a shop. I was making 3 x the amount in this recipe but when I looked at 650grammes of sugar I reduced it by 30% and it’s still melting the enamel on my teeth. Now, how can we have Mg of vinegar and red wine? Sugar, flour, rice etc in grams but liquid is in Ml. Alone in the kitchen but felt a complete idiot weighing wine. Hi Clive, thanks for the feedback. This recipe is actually meant to be fairly sweet, but also balanced in acidity (sort of like ketchup, which you would use as a condiment). I actually usually cook by weight in grams (rather than volumetrically by cups), and when I develop recipes for the blog I measure in both, just to be sure. I always weigh liquid too, rather than measure it because I find it to be more accurate and quicker in the kitchen. I’m not sure where you got the mg of vinegar and wine, both are listed in grams (which happen to be the same in mL). If you measured the liquid in mg then the recipe certainly would not have turned out! Sorry for the frustration and best of luck in the kitchen.